The Deer Monument, which stands about one kilometer from the hotel, is one of the loveliest and best-known points of interest in the Ma’ale Hahamisha area. The spot is beautiful and extremely tranquil; it is easy and simple to reach on foot and features wonderful views of the expanses of the Jerusalem Hills. along the road, to a dirt path that splits almost immediately into two separate paths. Walk eastwards along the righthand path, for about 400 meters, until reaching the monument erected to honor the memory of Yisrael Shapira, who fell at this spot in a battle during Israel’s War of Independence. A metal statue, “The Deer,” stands at the head of the monument’s concrete base, and a memorial tablet with explanation at the foot of the structure. Sculptor Michael Katz created the statue in 1979, based on a model built by Yisrael Shapira’s son Michael. It was positioned adjacent to the Sanitorium Outpost, which had been erected at the height of a slope known today as Hahagana Hill, which towers above Kiryat Anavim. of the British Mandate-period outpost at Radar Hill (known today as the community of Mt. Adar). 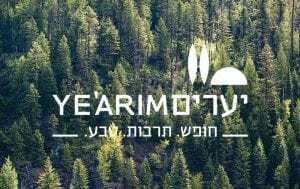 Return to the Yearim Hotel the same way you came. If you are interested in continuing, you could walk towards Mt. Adar.